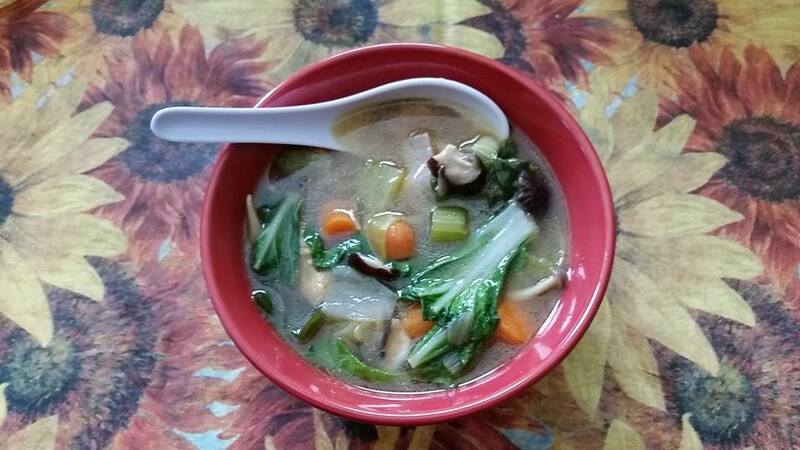 A light-tasting broth soup with plenty of veges and mushrooms. This tastes great and is quite filling with all the vegetables in it. The broth is the real challenge if you want to make it from scratch so I just defer and used low-sodium canned broth. Vegan option: You can of course eliminate the meat entirely and make this a vegetable based soup, in which case, the stock would be vegetable base, and you can skip Step 1 for meat, and simply heat the oil and proceed to Step 2. I would also double the amount of shitake mushrooms. Pat dry chicken with paper towels.Cut chicken into ¼-inch small slices. Toss chicken with salt and pepper. Brown chicken in the oil. Cover with splatter-shield which lets air out (but not a closed lid). Don’t stir too much, which allows it to brown nicely. Strain out chicken from the oil and place on a plate, set aside. Leave oil and all brown bits in the oil. Turn down heat to medium or med-low. Stir-fry the onion and the white parts of the leek first for 1 min. Cover lid for 3-4 minutes, lets it fry the water out of them. The steam will make the brown bits on the sides to wipe down. Stir the vegetables and scrap down any bits from the walls of pot. Raise heat to med or med-high. Add in chicken stock, water, ginger, shitake and enoki mushrooms. Pour in sesame oil on top. Place Thai basil and Bok Choy on top. Do NOT stir. You want to leave the leaves on top to just barely wilt. Turn off heat. Cover the lid. Let it steam itself for 5 minutes.